As I drove southwest from the Washington, D.C. suburbs, into rural Virginia, the Christmas music station on my radio faded to Fox news, and then to an oldies station, real oldies, 1950s. I was on my way to Staunton, Va., to interview a man I suspected was particularly brave. Back in 2002, Adrian Stacy put a gun to his own head. This evening, he’d agreed to talk to me about why and what happened afterward. But this part of Virginia throws out a genteel image of guns: Sport and hunting guns, guns in lockboxes, lovingly passed down from parents to children along with gun safety lessons and a tradition of Saturday shooting at the range. These are the guns that most everyone in America thinks they can live with. But the hard truth at the center of America’s relationship with guns is that while we like to believe we are in the most danger from guns in the hands of others — criminals and madmen — we are actually most in danger from guns in our own hands. Suicide strikes many more people than any other kind of gun violence: Two-thirds of the people who die by gun, die in a suicide. Some 70% of the 47,000 people annually taken by suicide are white men. Adrian Stacy was almost one of them. 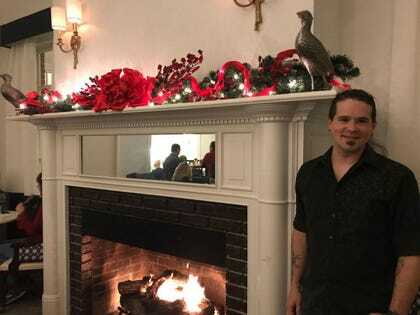 Sitting across from me in the lobby restaurant of the Stonewall Jackson Inn, which is swathed in bright Christmas decorations and busy with parties, he sits straight as the lobby’s tall tree, his hands folded in atop the table. His long brown hair is tied into a ponytail. The child of divorced parents, he was living with his mother and stepfather, a truck driver who was away most all the time. When his mother landed in the hospital for an extended stay, it fell to Adrian to take care of his younger sister. He was 15, and she was 8. Child protective services heard about it, and took her to a foster family. “I felt like I failed her,” he said. His mother taught him how to handle a gun, and he liked to take the family’s guns out of a lockbox, clean them and look at them. One night he sat on his bed, holding one of the handguns. He turned the music up, so no one would hear. He didn’t have many friends at school, but he did have one friend, down the street, Gary. Gary walked in the house. Hearing the music, he headed back to Stacy’s bedroom and opened the door. He pulled the gun out of Stacy’s hand just as the hammer cocked back. Suicide is, of course, deeply stigmatized – not just suicide by gun. Talking about it goes against a deep cultural and religious taboo, one of our deepest. Guns complicate the issue. While experts think the best way to cut the suicide rate is to limit access to guns, that idea runs smack into the middle of America’s ferocious gun rights debate. “The nation (is failing) to make suicide conversations discussions about firearms and firearm discussions conversations about suicide, said Michael Anestis, associate professor of psychology at the University of Southern Mississippi. “Red flag” laws are one of the new frontlines in the political war. They enable police to petition the court to take weapons away from people who pose a danger to themselves or others. But there’re most often mentioned in the context of mass shootings or domestic violence. In 2009, a suicide analyst for the New Hampshire Department of Health and Human Services discovered that in the course of less than one week, three people, not acquainted with one another, bought a gun from the same gun shop and killed themselves. Ralph Demicco was stunned. The owner of Riley’s Sport Shop in Hooksett, N.H., hadn’t heard anything about it, and considering his range a model of gun safety, he was deeply troubled. An ad hoc committee formed, including Demicco, made up of people from the more practical-minded parts of the gun community: firearms safety instructors, gun shop and gun range owners, and public health and suicide prevention experts. The group called themselves The Gun Shop project, which provides training and media to people in the gun community about suicide and encourages them to temporarily take a friend’s gun away if he or she seems to be in danger. They designed the program off what the evidence shows about suicide in America. The most commonly used methods of attempting suicide, pills and sharp instruments, result in death in 2% of episodes, compared with the attempts when firearms are used, which succeed 83-90% of the time. A gun is highly effective means to carry out a fleeting suicidal impulse: For example, 24% of people who made a nearly lethal attempt said that less than five minutes elapsed between deciding on suicide and attempting, according to one study. If you can interrupt a suicide attempt, you are likely to save a person’s life – for good. All the evidence suggest that in almost every case, suicide is a temporary mental illness. Among people who attempt suicide and survive, 90% do not go on to kill themselves. This is even true for people making nearly fatal attempts, according to the research. The effort has spread to 22 states, where there are coalitions of doctors, public and mental health professionals and gun shop owners and firearms instructors with training and materials to hand out if they suspect someone is in trouble. In Virginia, where Adrian Stacy heard about it, it’s called Lock and Talk. There has been a slow culture shift in gun businesses around the country, several have told me. One gun range in Colorado won’t rent to a first-time customer who comes in alone – unless a friend or relative can vouch for the person’s mental state by phone. The range, Bristlecone Shooting, Training & Retail Center, instituted the policy after someone killed himself in the middle of the range. It’s hard to tell if they have succeeded. The suicide rate has risen in the United States. It’s hard to prove a negative: Are there people who would have killed themselves if it hadn’t been for a conversation or if hadn’t been harder to rent or buy a gun? In the United States, where there are between 300-400 million guns in civilian hands, truly limiting access is hard. In Israel (another heavily armed society), according to Anestis, one small-scale effort worked. After the Israeli Defense Force saw a spike in young soldiers killing themselves, it changed the rules so that soldiers couldn’t bring their firearms home for the weekend. The suicide rate dropped. Demicco, who retired from his gun business after 40 years, said the movement has deliberately stayed as neutral and grassroots as possible. “If it became part of the political debate it would mean legislation,” he said. That would be anathema to him, and probably many of the other range owners and gun dealers. He said any movements to take guns away would run afoul of civil liberties concerns (it’s very hard to predict who will kill themselves); Constitutional concerns among gun owners and even concerns, he said, over privacy in the health care community. He his father to bone cancer in 2004. After he graduated from high school, he joined the military and became an automotive technician. A back injury left him unable to work, but he got a job at a pawn shop that sells guns. The suicide attempt remained a part of him, entwined with the pain of losing his dad. “It got bottled up so bad,” he says. Some of the pamphlets have been picked up. He looks up from the table where we’re sitting, nodding to a woman in a group of carolers that have wandered in, and I thought about how high the stakes are in a small community, where everybody knows everybody.